[i am a dekaphobic]: Tokyo Tokyo Ramen Trivia Quiz + Giveaway! Note: Giveaway has ended. Winner is already announced here. How well do you know your ramen? Take the Tokyo Tokyo Ramen Trivia Quiz to find out! Tokyo Tokyo Philippines has been serving affordable and delicious Japanese food for years, and they have another addition to their menu: RAMEN. And here's another wonderful news: a giveaway! 1. This giveaway is open to all readers, as long as he / she can use the GCs. 3. This giveaway runs from December 20, 2013 to January 11, 2014. 4. Winner will be announced on this blog. 5. Please do all the mandatory steps for your entry to be valid. 6. 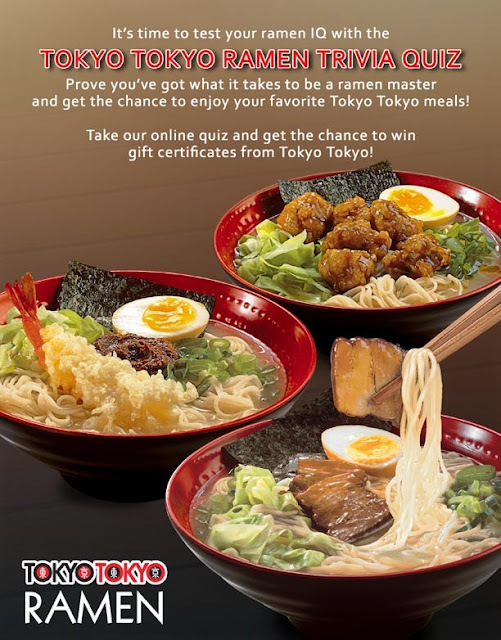 The winner will receive Php 1500 worth of GCs from Tokyo Tokyo. Thanks to Tokyo Tokyo Philippines for sponsoring this giveaway. "I answered 5 out of 6 questions correctly in the Ramen Trivia Quiz. 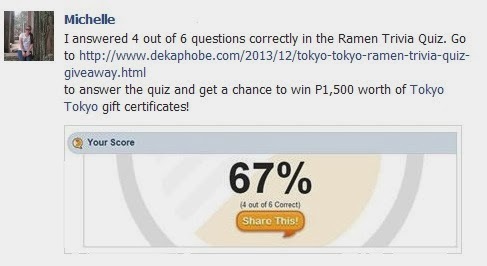 Go to http://www.dekaphobe.com/2013/12/tokyo-tokyo-ramen-trivia-quiz-giveaway.html to answer the quiz and get a chance to win P1,500 worth of Tokyo Tokyo gift certificates!"